As usual, Scotland offers the best of both scenery and history, melded into a single landscape that seems to beckon the viewer to return and return again. Coeffin Castle sits on the West coast of the island of Lismore, over looking the Lyn of Morvern. The ruins are such, that they look just like a craggy rock formation, but the remains of this stone built castle are quite extensive, though roof and wall rubble are now very overgrown. Above. Looking East from the Lyn of Morvern. The castle is thought to have been built on the site of a Viking fort. It was built in the 13th century possibly by the MacDougalls of Lorn, an ancient district in Western Scotland in what is today, Argyll and Bute. The area formed part of the Earldom of Argyll from around 1470. The island was an important part of land holdings of the MacDougalls, with St Moluag's Cathedral being an integral part of the island's fortunes. The island was a major Christian site in the Scottish isles and later became the seat of the Bishopric of Argyll. Above. Another view of the castle from the Lyn of Morvern. Written records of the castle only appear in 1469\1470, when the castle and lands were granted to Sir Colin Campbell of Glenorchy by Colin Campbell (1st Earl of Argyll) The castle appears to have been occupied for a relatively short time, possibly due to its remote location. The castle is a simple rectangular hall house with a bailey surrounding the castle walls. Whilst the castle most likely dates from the 13th century, the bailey was most likely added at a later date....it's unusual for a stone built castle of the hall house form to have a bailey area at all. The walls were around 2.5 metres thick offering fairly substantial protection for its residents. The castle is not alone on this part of the island....a few hundred yards to the North East, a large rubble walled fort can still be seen today. The Canmore website has a great collection of photos of the castle. I've finally found some more information regarding the deserted Medieval village of Dalton, situated just to the South West of Burton in Kendal, so thought it would be a good idea to update the site with some more detail regarding these earthworks. Documentary evidence exists relating to Dalton, in the Lay Subsidy Roles, dating from 1334 to 1336. These documents are records of taxation, and were kept between the 12th and 17th centuries. It appears that Dalton was occupied and flourished until its abandonment sometime between 1820, when it first appeared on the tithe map, and 1891, when it appeared on the OS first edition 25" map. The manor of Dalton is recorded in Domesday Book (1086) and is at this point, under Crown control. Sometime between the 11th and 12th centuries, the lands around Dalton passed to the de Croft family. By 1489 it had found its way into the control of Piers Legh. For the next three hundred years, until 1797, it remained a possession of the Legh family, with the last male heir being Thomas Legh in 1797. After Thomas' death, the estates passed to his sisters who sold it to the Rev. Geoffrey Hornby. From Geoffrey, the estates then passed down to Francis Mason-Hornby. It's possible that the caput, or the centre of Dalton was at one time Dalton Old Hall....possibly based around the tower (now in ruins) that's lies next to the modern (18th century) hall house. The village, North of the hall, would have been a collection of farmsteads built to take advantage of woodland, arable land and pasture. There is evidence here today of track-ways, building platforms, field boundaries, enclosures and ridge and furrow....all pointing towards a rich and successful farming community. To the South of Dalton, as photographed here, and the old hall, another settlement can still be seen in the landscape. A map of 1694 seems to suggest that these settlements had already been abandoned, possibly due to the establishment of a deer park associated with Dalton Hall. The park was granted a licence in 1372, to the de Croft family, and gave the family permissions to enclose some five hundred acres. Part of the park, some two hundred acres, encroached on land that had been used as arable and pasture for the settlements here. It's not clear if the creation of the park forced the inhabitants from their homes, or if the settlements here were already deserted. Some records make mention of a serious episode\episodes of plague that resulted in the area being depopulated, specifically mentioning village\s near Dalton old Hall. Whether a 14th century plague outbreak was responsible for the abandonment of some of these farmsteads is certainly not clear however. The Southern portion of the settlements at Dalton, not shown here, were still occupied to some extent between the 17th and 19th centuries. It was still a thriving community as late as 1820, as it is prominently documented on the tithe map for that year. Between the production of this map, and 1891 however, when the settlement was shown as deserted, something happened, either as a 'big bang' event, or a slow decline, with the result that it was totally abandoned. The last buildings to be erected in this general area, date from 1837 and 1865, now in ruins. Dalton still provides us with a great set of intriguing remains, seen as earthworks, standing and laying stones, boundary mounds, walls and building platforms. Open field systems can still be seen, ruffled with the lines of ploughing. 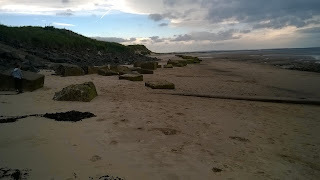 There are also a number of lime kilns scattered within the landscape, evidence of later industrial use of the area. Limestone outcrops are in abundance and would have offered easy picking for workers looking to process lime stone for domestic or small scale industrial use. Above. 1694 map of Dalton. This is a great site, with numerous remains, and it's fairly accessible from Dalton Lane which leads West out of the Southern end of Burton in Kendal. As usual, Scotland delivers yet another fantastic castle in some of its most beautiful scenery. Castle Sween is situated on the Eastern shores of Loch Sween on the West coast of Argyll, Scotland. In all probability, Castle Sween is one of the earliest stone castles built in Scotland, dating as it does from the late 12th century. The name Sween, is the anglicised version of Suibhne, the name of the most likely builder of the castle, possible grandson of Hugh the Splendid O'Neill, Prince of Argyll. The Clan MacSween traditionally governed huge swathes of land from Loch Awe in the North, to Skipness Castle on the shores of Loch Fyne in the South. However, the MacSween's lands in the area surrounding Knapdale (including the castle here on Loch Sween) found their way into the hands of the Stewart Earls of Monteith. As a result of this, the MacSweens pledged their support to Edward I in an attempt to wrest their lands back from the Stewarts during the Scottish Wars of Independence. Unfortunately their plans failed, and they were swiftly removed from all of their lands by the newly crowned Robert the Bruce. Robert the Bruce then went on to lay siege to Castle Sween which was being held by Alasdair Og MacDonald. Alasdair surrendered and was disinherited, losing Castle Sween, his lands and his titles to his younger brother Angus Og MacDonald. Edward II granted John MacSween the ancient ancestral lands around the Knapdale area, but the castle on Loch Sween was then held by Sir John Monteith. Sir John died in 1323, and the Lordships of Arran and Knapdale passed to his son and grandson. A large portion of Knapdale then passed to the MacDonald clan in 1376 when it was granted to them by Robert II of Scotland. The castle was passed to Historic Scotland's predecessor, the Historic Building and Monuments Directorate in 1933. The castle consists of four thick sturdy walls surrounding a courtyard. The walls have thick buttresses in the centre of each stretch of wall and at the angles, providing further re-enforcement. The gateway is in the South wall, providing exit and entry to the courtyard through ten foot thick walls. During the 13th century, the North East corner of the courtyard wall was demolished and a tower house was built, possibly to provide more appropriate and comfortable accomodation for the castle's stewards. The Western wall of the courtyard was altered during the 15th century, and a round tower, the MacMillan tower, was added to the castle's defences. Castle Sween was attacked in 1644, during the Wars of the Three Kingdoms, by Alasdair MacColla and the Irish Clan Donald. Such was the damage wrought during this attack, that the castle was rendered uninhabitable. The castle was never repaired and has been a ruin ever since. Frequent walks on the beaches around Cresswell and Druridge Bay in Northumberland on a recent family holiday, rewarded me with these images of World War II beach defences, still visible in the white sands. Stretching from Brig Head just to the South of Cresswell, right to the Hadston Carrs to the North, the beach is littered with the remains of pill boxes, tank traps and anti-tank ditches, paying testament to the seriousness of the threat of German invasion during the war. Above. Pill box almost hidden in the sand dunes. 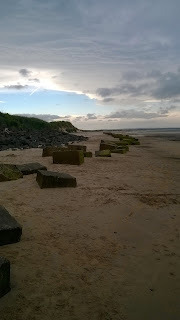 The pill box shown above and below, has at some point been undermined by the sea over the last 71 years, the constant battering of North Sea storms and tides causing it to be some way from its original position. 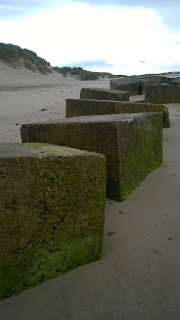 This would have been one of a number of pill boxes positioned along the beach, designed to slow down and impede any potential invasion from mainland Europe. One of the pill boxes, situated at the top of the sand dunes next to the road, was designed to look like a derelict cottage. There's a photo of this bizarre building here, and here. Above. 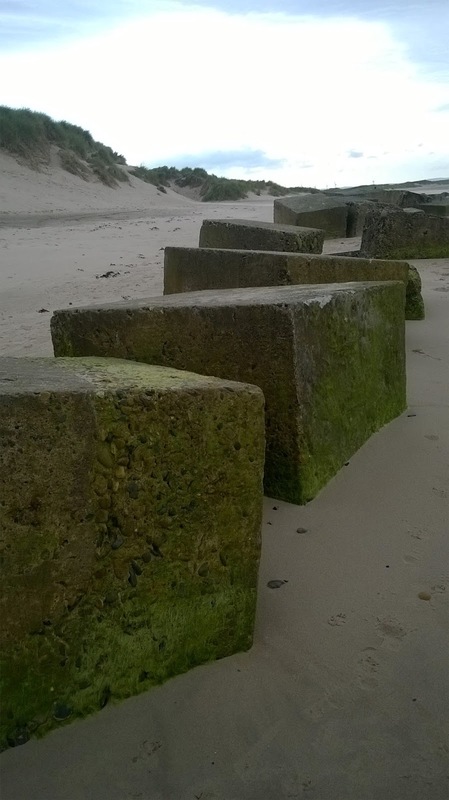 Concrete blocks making up tank traps, hidden in the dunes. Above. Second row of tank traps. 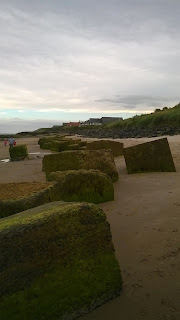 There are literally dozens of these cubes of concrete scattered all along the beach along Druridge Bay. 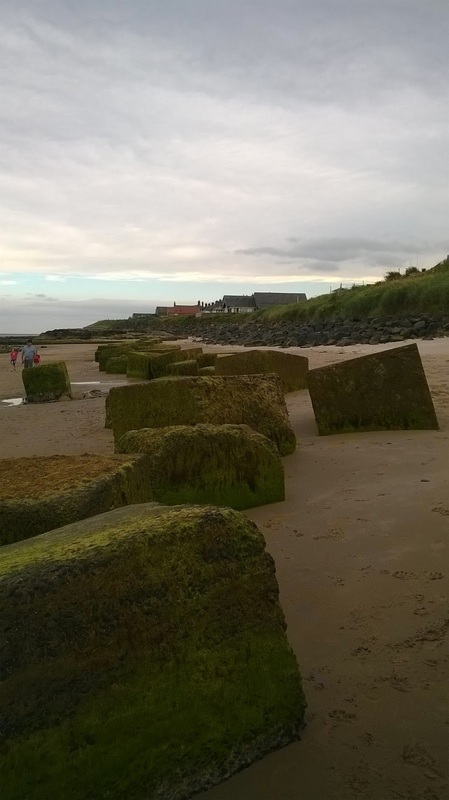 They were deposited in the sand, and designed to impede the progress of any tanks that invading forces would have wanted to unload from landing craft. Warkworth is a wonderful village roughly a mile North of Amble and four miles South of Alnmouth in Northumberland. The village is built in a loop of the River Coquet, only a short distance from the sea. Along with the bridge, the village has a beautiful castle and a stunning church, said by some historians, to have been built as a place of refuge. Warkworth bridge spans the River Coquet at the Northern end of the village, taking the A1068 North to Alnwick. Above. View of the bridge from the riverside to the West. Warkworth bridge is one of only two bridges that have managed to retain their defensive towers, the other being Monnow Bridge in Monmouth, Wales. The bridge is around eleven feet wide, and hence unsuitable for the amount of traffic passing through modern day Warkworth. A new road bridge has been constructed, bypassing the medieval bridge altogether. It consists of two arches, and has a neat central pair of pedestrian refuges in each wall above the triangular cut-waters. Above. View of the bridge's tower from the riverside. The tower is situated at the Southern end of the bridge, and is known as Bridge Head Tower. The bridge was built in 1378, and paid for from a bequest made by John Cook of Newcastle, who left 20 Marks towards the construction of a new bridge and its tower. The tower is ruined above the ground floor and roofless, but would have once housed a 'guard room' where a porter would most likely have lived. His responsibility would mainly have been for monitoring traffic coming into and leaving the village....more of a toll house than a pele or solar tower. Above. The bridge's tower looking North from Bridge Street. The tower is roughly eight and a half by five and a half metres, and would have originally stood to two storeys. A newel stair can still be seen giving access to the upper storey. The upper chamber has a fireplace...always a good indication that a building such as this was intended to be occupied, if not full time, then for long periods. Above. The bridge and its tower from Bridge Street. Above. The tower from Bridge Street. The bridge and the tower are, surprisingly, only Grade II listed, though the whole structure also has Scheduled Ancient Monument status. It's great that the bridge and tower are freely accessible and not blocked off and locked up.